Bethesda Metro Area Village is part of a national aging-in-place movement dedicated to providing services and community support that allow people to remain in their homes as they age. BMAV can help you stay in your home -- safely, independently and in the community you love. We offer volunteer-provided services, social activities and programs to make "aging in place" a more feasible option for many. BMAV is a non-profit 501(c)(3) volunteer-driven organization. As in any village, those who are in a position to volunteer to assist others do so, and those in need know where they can turn to receive assistance. Our village covers the areas of Battery Park, South Bradley Hills, Bradley Village, Edgemoor, English Village and Greenwich Forest. 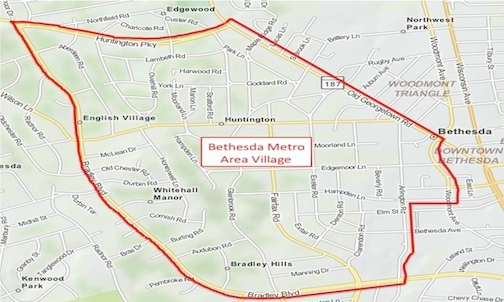 If you live within the BMAV boundaries of Woodmont Avenue, Hampden Lane, Arlington Road, Bradley Boulevard, Huntington Parkway, and Old Georgetown Road, and are age 50 or over, you are eligible to become a member. Click here for a membership application. *Please contact us if you live outside our neighborhood boundaries but are interested in becoming a social member. please click below to zoom in for detail and street numbers. Call or email us with any questions at 240-630-2628 or director@bmavillage.org. We look forward to hearing from you! 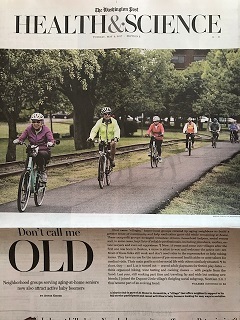 why baby boomers are joining villages too!